Uses: many industrial applications, including brake linings and fireproof fabrics and as an ornamental stone. Lizardite; Mg3Si2O5(OH)4; trigonal and hexagonal. Their differences are minor and almost indistinguishable in hand samples. 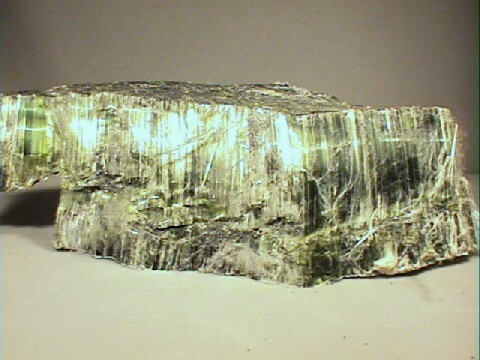 However, the chrysotile minerals are more likely to form serpentine asbestos, while antigorite and lizardite form cryptocrystalline masses sometimes with a lamellar or micaceous character. Asbestos had been used for years as a fire retarding cloth and in brake linings. Its links to cancer however has led to the development of alternative materials for these purposes. Serpentine's structure is composed of layers of silicate tetrahedrons linked into sheets. Between the silicate layers are layers of Mg(OH)2. These Mg(OH)2 layers are found in the mineral brucite and are called brucite layers. How the brucite layers stack with the silicate layers is the main reason for the multiple polymorphs. The stacking is not perfect and has the effect of bending the layers. In most serpentines, the silicate layers and brucite layers are more mixed and produced convoluted sheets. In the asbestos varieties the brucite layers and silicate layers bend into tubes that produce the fibers. Serpentine can be an attractive green stone that takes a nice polish and is suitable for carving. It has been used as a substitute for jade and is sometimes difficult to distinguish from jade, a testament to the beauty of finer serpentine material. Non-fiberous serpentine is not a cancer concern. Asbestos serpentines should be kept in closed clear containers, but makes an attractive specimen. Sometimes with a golden color as the name chrysotile in greek means golden fibers. Best Field Indicators softness, color, silky feel and luster, asbestos if present and its flexibility.